Art is not designed to be permanent. Its transience, its ability to capture a precise moment of time, experience and reflection is what holds its power. But what art needs is a community as a solid foundation to keep ideas flowing. 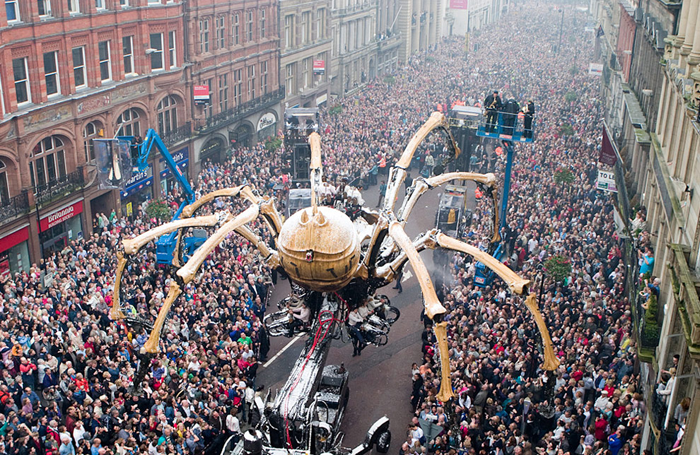 Next year marks the 10th anniversary of Liverpool swaggering its way through its year as European Capital of Culture. We’re not a city that often needs an excuse for navel gazing, but next year will inevitably encourage just a moment of reflection about legacy. How solid is our foundation? The long-term health of Liverpool’s cultural community is facing a triptych of threats: funding cuts, developers, and a lack of conversation and coverage about the arts in the mainstream media. First funding cuts. Liverpool City Council has lost 58% of its central government funding. The increasingly concerned word on the street is that the arts and culture sector is up for a swinging axe, some rumours suggest by up to a third. There’s a danger of centralisation, with major venues and attractions scooping up the funds. Art can’t just be created in the light, it needs a vibrant and diverse earth to feed growth. The last round of Arts Council grants saw more NPOs created. It’s important they help smaller organisations, galleries and individual artists to flourish. Liverpool’s Capital of Culture year was such a success because partnerships created a sense of community and possibility. Doors need to be open, thresholds need to be crossed. Art needs to be accessible. When Liverpool secured Objective One funding, its culture – particularly its superclub Cream – was signalled as a major part of the city’s intent. Glistening flats now await their cladding, towering above Cream’s grave. The Kazimier, the original Cavern Club, Liverpool Small Cinema – progress often means demolishing popular and important venues. Artists get moved on, more “attractive” residents are moved in. At some point, though, there will be nowhere to be moved on to. Liverpool’s cultural community has long been peripatetic but it’s becoming so disparate it’s becoming hard to rub shoulders. Not everyone wants to move along the docks and out of the city centre to make way for designer stores. The power of Liverpool’s artistic community comes from its multi-platform, multi-disciplinary nature. Experimental musicians have day jobs as visual effects artists, painters share space with sculptors and poets, writers are podcasters and fundraisers. Having space to play is vital. Artists can be gentrifiers, and often are, but developers can be sanitisers. Creators and artists need more of a say on what cities become. One of the most dismal legacies of 2008 is that there is no arts editor in Liverpool. BBC Radio Merseyside lost its peerless ArtsWaves programme, the last art editor left the Liverpool Echo earlier this year. The Skinny North West has gone. The local TV station, Made in Liverpool, just swapped its local arts programme, Lowdown Liverpool, for a national Big Daily. There are still arts words written. Bido Lito has evolved from music to culture, Double Negative compiles excellent critical writing, Art in Liverpool remains a stalwart. But they can’t cover everything. Understanding how to reach audiences is a challenge even for the largest of arts organisations. For an independent producer with a theatre show to sell it’s tough. Not everyone can afford marketers and PRs. When no one talks about you in the mainstream you can believe as though you’re screaming into a void. There’s little critical reflection, little fanfare. If art isn’t worthy of column inches or a front page then what does it say about how we see our culture? This isn’t about recognition, but it’s about a city defining how it wants to be seen. If culture can regenerate then it’s about aspiration, isn’t it? About how you want to see yourself. Art isn’t always easy to talk about, or easy to write about, but that can be a role for the media, to help teach arts organisations about how to talk to their audiences. Neither side should be spoon-fed but it’s vital they talk, otherwise we just end up talking to ourselves. Social media means our circles are getting smaller and smaller. The people of Liverpool were the factor that swayed the culture judges in 2003. They were used to art being in the public realm, of artists as avant-garde as Yoko Ono having a place in the city’s most popular shopping street. Culture was part and parcel of the city’s conversation. Spotting something weird in the street, and we became used to the refrain: “Oh that’ll be that Biennial, queen”. Liverpool has long had a rich and vibrant cultural community. It’s what has pulled the city through, time and time again. It risks becoming a sideline, a footnote. And when the culture has gone, what do we sell our city as a capital of?